One year ago, just as controversy descended, Proto published an interview with South Korean stem-cell scientist Woo Suk Hwang. 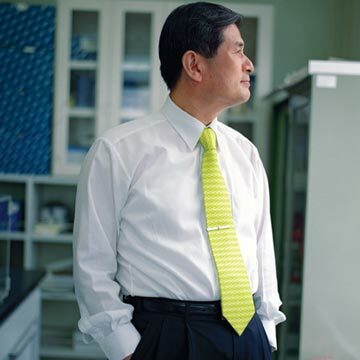 He had not cloned human embryos and created stem cells from the clones, as he had claimed, and he had paid women for their eggs—violations that resulted in an ouster from his post at Seoul National University and the retraction of two papers from the journal Science. Now on trial in Korea, Hwang is charged with fraud, embezzlement and bioethics law violations. The scandal led to a predictable amount of hand-wringing over the role of scientific journals in rooting out fraud. But with the benefit of hindsight, what aspects of Hwang’s behavior should have raised red flags? Image manipulation might be on that list. One photograph in the 2005 Science paper purported to show that a particular protein normally found on adult cells was not present on the surfaces of the pictured cells—thus proving they were stem cells. But two images submitted for publication with the paper were identical (thus duplicates). Mike Rossner, managing editor of The Journal of Cell Biology, says he likely would have noticed this during his usual screening process for images submitted to his journal, and that it would have led to a request for the original image data from the authors—not a fail-safe, because they could have submitted other faked images. Indeed, Science editors noted that the duplicates were sent when Science requested higher-resolution photographs. This wasn’t the only instance of deception. After the 2005 paper was submitted, peer reviewers asked Hwang’s laboratory to carry out DNA fingerprint testing—an analysis of particular genetic sequences known to differ greatly between individuals—to prove that the stem-cell colonies matched the human cells from which they were supposedly cloned. In the published paper, however, the fingerprint data were so similar because they were in fact created with the DNA from each of the original human cells, according to the report by the committee at Seoul National University that investigated Hwang’s work. In a 2004 paper, Hwang claimed to have cloned a human embryonic cell and then to have derived embryonic stem cells from that clone. He said the clone he produced had come from the nucleus of a somatic cell (any cell in the body except sperm, eggs and the cells that make them) from the same woman who provided the eggs. That, scientists said, would have rendered meaningless one test of the clones’ authenticity—a comparison of mitochondrial DNA—and made it impossible to tell whether the cell line was derived from the cloned embryo, as they claimed. (In a clone created from another donor egg, the mitochondrial DNA would have been different from that of the somatic cell donor.) Subtle, but a red flag nonetheless: To support their claim that they had created clones, other scientists might have used eggs and somatic cells from different women. More blatantly, perhaps, in the 2004 paper Hwang claimed that establishing the first human cloned cell line required 242 eggs. But for the set of experiments he performed for the 2005 paper, that number fell to 17 per cell line. Cloning is extremely difficult in humans for reasons unknown; not even a vastly improved technique could account for such a low figure. In fact, as many as 1,100 eggs may have been used in the 2005 study. Whether editors of scientific journals will learn lessons from the Hwang case remains to be seen. Some are incorporating image screening into their procedures, and others say they will look more carefully at original data. In November an independent panel convened by Science recommended that the journal apply special scrutiny to papers that are likely to generate a great deal of public attention. Editors are clearly shaken, but many seem to consider rooting out fraud the responsibility of universities rather than journals.